mommy bytes: Tuesday Toot - I Got the Nerd! Tuesday Toot - I Got the Nerd! 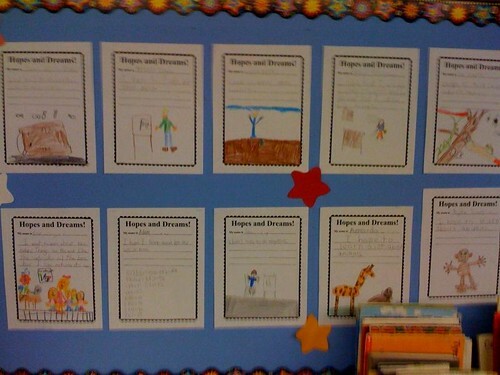 Do you see these colorful drawings made by Adam's second grade class about their hopes and dreams? There are drawings of animals and people and all sorts of wonderful things. (Sorry for the poor cell phone pic, but at least it makes obscuring the names easier.) But what's that sheet on the bottom row with just pencil and no picture? 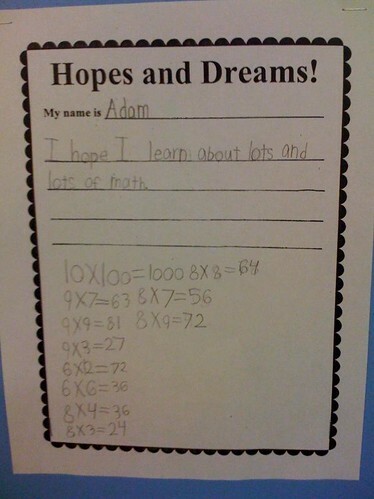 "I hope I learn about lots and lots of math." Apparently, Adam will have none of this sissy drawing stuff. Way to put up those multiplication equations at the beginning of second grade. That's my boy, I got the nerd! I have a bin of plastic happy meal toys on my desk at work, with a Far Side cartoon that reads, "Oh, boy! The Nerd!... Now my collection's complete!" Unfortunately, I can't share this cartoon with you due to the cease and desist orders from Gary Larson. I could have sworn that when I first drafted this post, there were still copies of this cartoon floating around the net, but they are all gone now. So much for the age of share and share-alike, gotta squeeze every penny out of that copyright law.